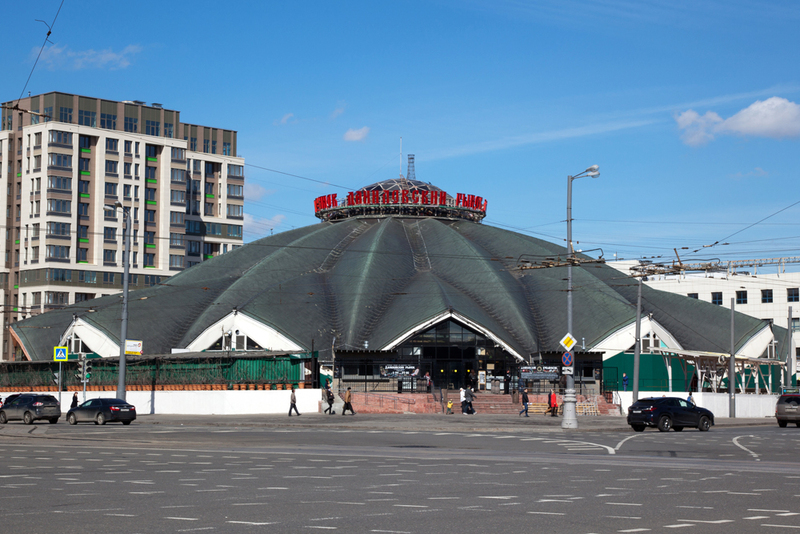 The oldest Moscow market is covered by a dome. In the past few years, Moscow has gone through a true gastronomic revolution. Today, practically any dish from any national cuisine can be found in the Russian capital, even despite the food sanctions. And if you’d like to try a little of everything in one sitting, check out one of these food markets. Food markets are spaces that bring together tiny cafes and bars, giving visitors a chance to experience different cuisines and culinary concepts in one space. This global trend is finding fertile ground in Moscow, with new locations popping up even outside the city center. At first glance, the Danilovsky market is an unlikely spot for 21st century food experimentation. This market, the oldest in Moscow, was founded at least by the 14th century and gets its name from the nearby monastery. For centuries, the rows of stalls - and the products in them - remained virtually unchanged. In 1986, the market was covered with its now-iconic dome, and last year, the market was expanded to include small restaurants. Today visitors to Danilovsky can buy fresh produce and meats and grab a snack before heading home to cook. Around the perimeter of the dome are more than 20 cafes featuring a wide variety of cuisines. There is Georgian (Che kharcho), Dagestani (Dagestanskaya lavka), a sandwich bar (United Kitchen), both Italian and Russian dumplings (#Propelmeni and Fiorella Pasta Fresca) and Cypriot (Koupes bar). A visit to the Danilovsky market has an element of time travel, bringing visitors into contact with the Moscow of the 1500s, the 1980s and the 2010s. The activity at this food market is enough to bring hipsters and foodies to its location in a bedroom community far from the city center. There is always something interesting going on here, including workshops, lectures and detox festivals. “Different people come here, lots of family people, mostly those who live in this area. Some come here on purpose from far away on weekends. There are few expats now, but I hope there will be more,”said barista Marina Khyuppenen of CezveCoffee. The ecomarket began to develop only last fall, when local fast food places started to be replaced with small ethnic food shops. Two groups that operate at Danilovsky market are also here: the Cypriots from Kоupos Bar and Dagestanskaya lavka. Other options include German cuisine (Wunderbar), Uzbek (Plovbox.ru), Italian (Da Lorenzo), a meat restaurant (Ribs & Burger) and a speciality coffee (CezveCoffee). The food court backs up to the original Kitayskye Novosti (China News), with its unbeatable soup dumplings. The ecomarket at Konkovo supports the global trend towards farm-grown and eco-friendly products, and there is a branch of the Gorod-sad market here. This Russian version of Whole Foods stocks bio, organic, raw and vegan products. This two-year-old space is always full of locals and tourists alike - no doubt helped by its convenient location at the intersection of Novy Arbat and the Garden Ring. Here Asian noodles (Asia Today) rub shoulders with crab dishes (Crab'n'Caviar), Belgian waffles (Waffle), Georgian khachapuri (Mimino), Israeli forshmak (Gelman) with Greek gyros (Giros) and Mexican tacos (El Tacodor). The 21 also features several bars serving up unique (and strong) cocktails.